Bison like the type found at Comstock Premier Lodge in Sargent, Neb. Comstock Premier Lodge bed and breakfast and hunting lodge in Sargent, Neb. One of Nebraska's famous sunsets from the area around Comstock Premier Lodge. Call it fate, or karma, but 10 years ago Roxanne and Mitch Huggins had another thought for the circumstances that led them to purchase the Comstock Lodge. They came to the area and fell in love with the property. Comstock Premier Lodge is now a full-fledged bed and breakfast and hunting lodge open to the public. The Huggins have worked hard to build the hunting options after they purchased the property in 2009. They offer bison, elk, deer, turkey, pheasant and upland game bird hunts, along with these exotic animals: Aoudad, Red Sheep and Big Horn Sheep Cross. Plus they offer predator hunts to keep those populations in check. The bison are divided into two herds, some on the lodge property and the rest across the road on a 3,000-acre ranch the Hugginses also maintain. They expect about 20 bison calves to arrive in mid-May. There were elk on the property and the couple now has 13 cows in pens, six babies from last year and one bull. This year they are expecting 10 baby elk in mid-June. The Aoudad are a type of African sheep, Roxanne said. The Red Sheep are a hybrid cross between Armenian Mouflon and Transcaspian Urial sheep. Their Bighorn Sheep are all crossed with other types of sheep. Hunting options and costs vary from species to species and are all listed on the lodge website, Roxanne said. Prices range from $8,495 for a fully guided three-day/four-night all-inclusive elk hunt to corporate hunt packages to two-day/three-night fully guided predator hunts for $995. A plus for hunters are state-of-the-art walk-in coolers and freezers, which the Huggins have at the lodge for keeping meat for hunters to take home. Tours of the various animals out on the range are popular. 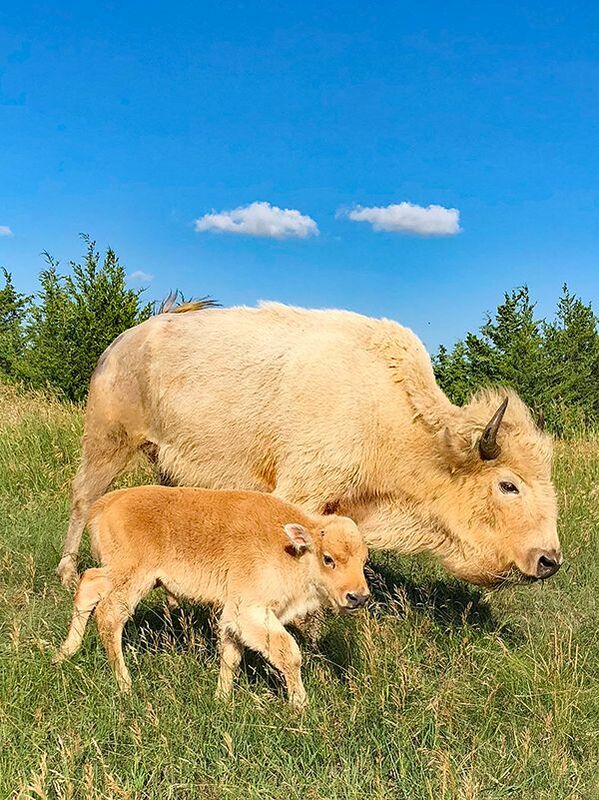 “We offer tours either right around the lodge or the Ranch Safari where we actually go out on the ranch, which gives guests a peek at the Bohemian Alps of Nebraska,” Roxanne said. The lodge property tour costs $15 per person, the Ranch Safari is $20 per person and a combined 2.5-hour tour of both the ranch and lodge property is $30 per person. While hunting is a big attraction for many of their visitors, the Hugginses note they have visitors from all walks of life at the lodge. “There is interest in the dark sky at night. We have many birdwatchers as we’re on the edge of the flyway zone. The scenery attracts photographers and because we are right in the middle of the United States it makes it easy for families to gather for reunions or celebrations such as anniversaries and birthdays,” and she added, they have also done some small weddings at the lodge. The lodge sleeps 34 and has amenities such as a large kitchen with two stoves, two refrigerators, two dishwashers and every type of cooking utensil and pots and pans needed for a crowd. Large groups have the option of doing their own cooking or having meals prepared for a fee. A gourmet breakfast is made for bed and breakfast guests. “Everyone compliments our cook, Emily,” Roxanne said. The Hugginses have tried to maintain a rustic atmosphere with no TVs in the rooms, but they do have a TV room, along with books, puzzles and games, although most large groups bring in their own activity materials. They can also assist guests with suggestions for off-property activities such as tanking excursions and trips to area breweries or wineries. Other amenities include a steam room, a fire pit, and a large deck equipped with binoculars and a spotting scope. “You can see the elk, bison and aoudad from the deck,” Roxanne noted. Business is steady most of the year, the owners said. Turkey season started April 8 and goes for 45 days. From then through January the cycle of hunting and visitor seasons is full. During January-March when business slows down, Roxanne and Mitch travel to safari trade shows. For anyone contemplating a similar operation, the Huggins point out that the business is labor intensive. But that one-on-one, day-to-day work also sets them apart from other fee hunting operations. “One thing that makes us different is the hunters get to interact with us, the owners. That actually gives us a lot of positive comments,” she said. Another fun aspect of the business is taking guests on the safari-style tours. Perhaps the biggest hassle annually is renewing their liability insurance. This spring they are challenged by the road situation and massive amounts of mud, she said. But the challenges are far outweighed by the opportunity to be their own boss and share God’s creation and creatures with visitors. For more information check out Comstock Premier Lodge on Facebook, the lodge website at www.comstocklodge.com and reviews and rates on Booking.com and TripAdvisor.